We are sending a big thank you to adopters who opened their hearts and homes to 44 of our shelter animals over the Australia Day weekend during our Mates Rates adoption drive. Our North Melbourne Shelter saw a total of 12 dogs, 10 adult cats and 18 kittens adopted, while in Echuca adoptions were slower with three dogs and only one kitten adopted across the national holiday. We also had four senior dogs above seven-years-old adopted from our North Melbourne shelter on Friday before the promotion even kicked off! While we are on the whole encouraged by the number of adoptions, we still have a large number of cats still looking for homes at our shelters. Our Echuca shelter in particular is overflowing with kittens, whilst a number of cats at our North Melbourne shelter have been waiting months for a new home. To give our cats a helping paw-up we will be extending our Mates Rates adoption drive for cats aged six-months and over! All cats over 6 months and older will be available to adopt for half the standard adoption fee as part of the extended drive. Please help us find homes for our long term adult cats! 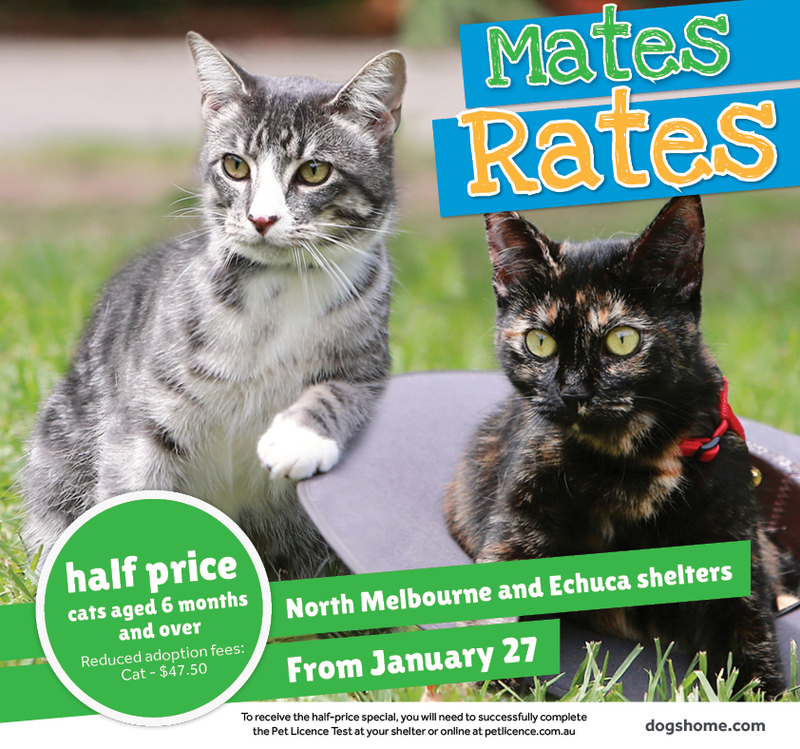 What: Extended Mate’s Rates half-price adoption drive for cats aged 6 months and over.